The young, edible shoots of the bamboo are well recognized amomg chinese cooking ingredients as part of stir-frys and chow mein type dishes. Widely available in cans, these of course as in any ingredient are best when fresh. You might get a better quality in a Chinese or Asian market, but there are some canned brands that offer good quality. Bamboo shots are usually harvested from the provinces to the south and southwest of Shanghai, but are featured in most types of Chinese cooking, especially Hunan and Cantonese. Everybody’s heard of these Chinese cooking ingredients – “in Black Bean Sauce” ring a bell? 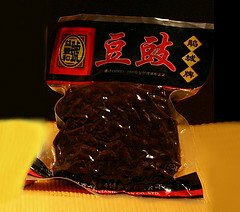 Black beans are actually small soya beans, and are preserved by fermenting them in salt and spices, which give Black Bean Sauce its unique flavour. Often they are used together with ginger and garlic and are a great way to add fibre and protein to your diet. You can buy them in Asian specialty store and Chinese grocers, and will store for long periods in the refrigerator. 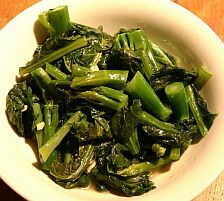 Chinese Broccoli is not especially available in western supermarkets, but can be found in Asian stores around the world. It is actually a member of the mustard family that resembles Swiss chard in flavour, but is prepared in a manner similar to broccoli. It’s delicious in a stir-fry but can also be used to give a peppery flavour to salads. 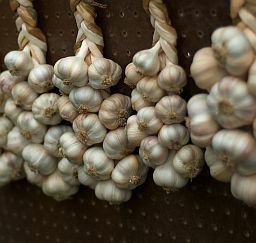 Garlic has been a primary ingredient in Chinese cooking for many centuries; in fact it’s one of the ingredients that give Chinese recipes their distinctive flavours. There are a variety of ways that the Chinese use garlic; minced, whole, chopped, crushed and pickled, and it is used to flavour spicy sauces, especially when mixed with green onions or fresh ginger. 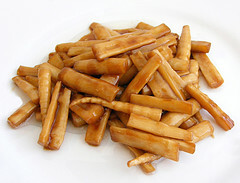 Fresh Ginger Root is a staple ingredient of authentic Chinese Cooking. Having a spicy, sweet, fresh taste, it adds a distinctive flavour to soups, sauces and stews. As it neutralizes heavy fish smells and flavours it is widely used in seafood dishes and many Chinese drink Ginger tea as a tonic or digestive after meals. The pale brown skin of the root is pealed away before ginger is chopped or minced and added to recipes, and easily keeps in the fridge for weeks, even months. 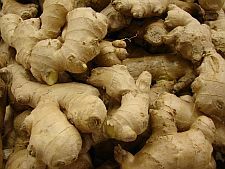 It is a much preferred to use fresh ginger root than powdered ginger due to the fresh roots fresh, clean taste, and the powdered ginger has a more bitter taste which alters the flavour of food to its detriment. Bok Choy is probably the best known of the Chinese cabbages and is one of the most popular Chinese cooking ingredients on the planet. The smaller the plant, the sweeter and tenderer it is. This is a superbly tasting vegetable, my all time favourite amongst Chinese cooking ingredients. This healthy protein-rich food is more recognized by its Japanese name of tofu. As you may know, tofu or bean curd is very popular in vegetarian and vegan recipes as well as in organic and vegetarian restaurants. There are two main types of bean curd used in Chinese cooking, the silken or soft type, and the more firm “cake style” tofu which is used in stews and stir fry dishes. Bean curd is readily available nowadays not only in Asian or Oriental markets but in mainline supermarkets and health stores as well. These staples of Chinese cooking are the sprouts of mung beans, originally from India, they were brought to China thousands of years ago and are revered for their health benefits. They are used for fillings in egg rolls and stir-fried. They don’t keep as well as other chinese cooking ingredients, so should be bought fresh and eaten quickly. Everybody has heard of Bird’s Nest Soup, and though it is considered a delicacy, it really is a flavourless jelly like substance that takes its taste from whatever broth or sauce it is cooked in. There are various types of Bird’s Nest used in Chinese cooking, and they have been chinese food ingredients for over four hundred years. The birds whose nests are harvested for this unique dish are known as Swiftlets, either Black or White, the nests of the White Swiftlet being the preferred by connoisseurs. 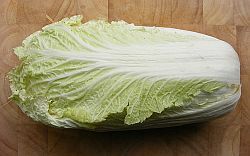 Choi sum is also part of the mustard green family and is not to ne confused with Bok Choy (Chinese White Cabbage). The small yellow flowers of this vegetable are eaten along with the stems and leaves, and besides tasting great, adds a dash of colour to your stir-fry. These beans are sometimes called yard long beans because they can actually grow up to a yard or meter in length. These beans are not related to green beans and are usually best harvested when they reach between 18 and 20 inches in lengths. They actually cook faster than string beans, but do have the same crunchy texture and a similar taste. The Long beans can be used in stir-fry’s, casseroles, soups, or can be steamed or blanched and chopped and served as a side dish. The Chinese white radish, or Mooli, is sometimes referred to by its Japanese name, Daikon, which literally means “large root”. A perfect white radish will be heavy, solid and unmarked, and slightly translucent when peeled. It is one of the rarer Chinese cooking ingredients, used in dishes like dim sum. The Chinese use several different types of starch in their dishes, such as; water chestnut powder, arrowroot and taro starch, items hard to find outside of China. Used to thicken sauces and to make batter, corn flour is an excellent substitute for these elusive ingredients. It doesn’t alter the flavour of the dish, and only a small portion is required to do the job. Used as a marinade it aids in coating the food properly, and adds a velvety texture to the dishes. Corn flour also protects meats and vegetables when deep frying them, sealing in the flavours and preventing the item from drying out. To use corn flour as a binder or thickener, you must mix it with cold water to form a light paste, and then add it slowly to the recipe to bring to the desired thickness. To form a batter it is generally mixed with eggs to create that crispy texture you get in dishes like sweet and sour chicken. Five spice powder is quite easy to locate in western supermarkets these days, but failing finding it there, Asian food stores will definitely have it. The powder is a mixture of star anise, Sichuan pepper, fennel, cloves and cinnamon and produces a pungent, spicy, fragrant and somewhat sweet flavour to recipes. Used in dishes such as Crispy Sichuan Duck, it provides an exotic flavour and fragrance that will wow your guests at dinnertime! Almost every rural inhabitant of China keeps or has kept pigs, and it’s no surprise that Ham is a widely used ingredient in Chinese dishes. Used as a garnish, main ingredient or to flavour soups and stir fries, the Chinese Ham has a flavour distinctive from that of its Western counterpart. Parma Ham makes a reasonable substitute, as Chinese Ham is very difficult to find outside of Asia, even in Chinese markets. Failing that, lean or smoked bacon with the fat cut off may be used. Tiger Lily Buds are definitely one of the most authentic Chinese cooking ingredients, and are used in Mu Shu dishes and Hot and Sour Soups. The dried lily bulbs add a distinctive texture and an earthy taste to any recipe. The bulbs are soaked in hot water until they are soft (about 30 mins.) before being used, are inexpensive, and easily found in Asian markets and grocers.